Taifas of Algarve. Musa b. Muhammad. Silver Dirhem. AD 1234 to 1262. - rare type. The Taifas of Algrave, were an Islamic dynasty in Portugal. Denomination : Silver Square Dirhem. 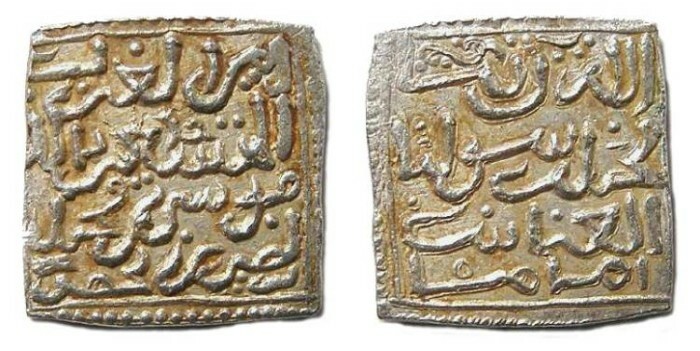 Date & Mint : This type was struck without a date or mint. Size : 13.5 x 13.9 mm. Weight : 1.49 grams. The inscriptions give the title is amire al-gharb, meaning "amir of the west", which is a direct reference to the region of Portugal known as the Algarve. All coins of Islamic Portugal are relatively rare and seldom offered for sale. A hoard of this type found some years ago as made this type temperarily available.